What an exciting year it’s been and I can’t believe Dreamforce is right around the corner. It was only last year when Salesforce first formally unveiled Wave Analytics and so much has been accomplished since then. Today, through the power of the Salesforce partner ecosystem, Wave apps are available to more roles, departments and industries than ever. Analytics will continue to be a big focus across Dreamforce 2016 and there will be a lot of discussion around Wave advances, predictive analytics, Machine Learning and Artificial Intelligence with Salesforce Einstein taking center stage. With all of these new apps and capabilities there is a lot for customers to make sense of. We can help. If you’re new to analytics or just getting your program up and running, please consider joining one of the following sessions where our customers talk about their early successes with Wave and how it helped executives, sales, and service teams gain greater insight into customers. Intro to Wave for Service on Tuesday, Oct. 4 at 4:00pm in the Marriott Marquis (Foothill G1-G2), featuring Justin Antone and Jessica Peterson, Services Operations Analysts at Veracode. Wave Analytics Best Practices: How Optum is Transforming Business with Wave on Thursday, Oct. 6 at 1:00pm in the Marriott Marquis (Foothill G1-G2), featuring Ted Homa, Growth Enablement Technologies at Optum. Improve Sales Forecasting with Predictive Analytics on Tuesday, Oct. 4 at 10:00am in the Marriott Marquis (CRM Outfitters Theater North), featuring our CTO Girish Reddy. Here you can also see a demo of SpringML’s newest predictive analytic app, Lighthouse for Sales. How to Drive Wave User Adoption Within An Enterprise on Wed, Oct. 5 at 9:30am in the Marriott Marquis (CRM Outfitters Theater North), featuring myself and Shankar Krishnan, Senior Director, Growth Technologies and Systems at Optum. This is a great story about how a large, global health services company is adopting Wave across 20 different business units. Get Data-Driven Sales Growth with Wave Apps on the AppExchange on Friday, Oct 7 at 9:00am in Moscone West (Room 2011). This panel discussion with Gabriel Kacarab at Salesforce, our CEO Charles Landry, SpringML and customer Suzan O’Leary from Abiomed and a host of others will show you the breadth of the Wave ecosystem. Join us for lunch at the Wave Analytics Lounge at 111 Minna on Thursday, Oct 6 at 12:00pm to hear a live Q&A with our CEO and Maria Perkins, VP of Growth Technologies at Optum. Optum is a multi-billion dollar global health services company that strives to make the health system work better for everyone. As a company they invest $2.5B annually in technology and innovation, and are always looking for ways to better serve customers and grow their business. Maria and Optum were early adopters of Wave, and have since rolled Wave out to leadership team. 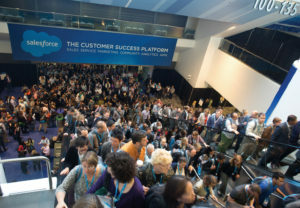 Hear what motivated her, what she’s learned along the way and why 50+ members of the Optum team will be descending on Dreamforce. Contact us if you’re interested in joining this lunch or scheduling a one-on-one meeting at the lounge. If you’re interested in some quality, one-on-one time with our experts, there are a few different places where you’ll find us. If you want to speak one-on-one with one of our experts, see our products in action and hear a few customer case studies, come by Booth #2142 on the Expo Floor. If you’re interested in Einstein or what’s possible when you apply AI and Machine Learning to your CRM data, stop by our exhibit in the Einstein Discovery Zone on the Second Floor of Moscone West. If you’re an existing SpringML or Wave customer, come visit us at the Wave Lounge at 111 Minna Street where we’ll be manning their genius bar and giving a sneak preview of what we’re working on. Dreamforce ‘16 is going to be the best yet. For more information on SpringML events and speaking engagements visit our Dreamforce site.